Lyndale Community School is hosting an event for families who want to learn more about their neighborhood school option. You are welcome to join students, teachers and parents to hear what makes their school special. There will be food, activities and music from the school band. They hope to see you there! Reading Partners is seeking volunteer tutors at Lyndale Elementary School and Whittier International Elementary School. Their volunteers fight for educational equity for students in Minneapolis by working to reduce the achievement gap for students of color and students experiencing poverty. Volunteers make a lifelong impact on a child who struggles with reading, setting them up for future success. Give as little as one hour a week (we welcome more, if you are able)! Tutoring takes place Monday-Thursday during school hours (approximately 8am-3pm). Follow a highly effective, structured, and easy-to-use curriculum. No formal teaching experience is required. Change your life and the life of a child by developing a positive, mutually transformative relationship. For more information or to sign up, please visit our website, https://readingpartners.org/ or contact us at volunteerTC@readingpartners.org or (651) 362-0430. Student musicians now have the opportunity to learn, play and perform on stringed instruments through Lyndale School’s new orchestra program. This is a great addition to an already strong music program, which now includes orchestra, band and vocal music. The vocal music teacher, Clare Farrell, works with almost all of the 580 students at Lyndale School once or twice per week. 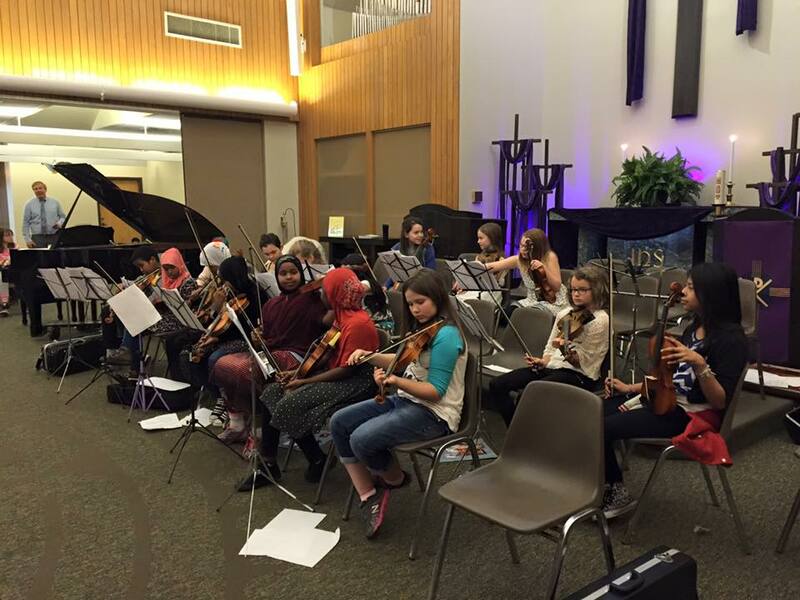 The initiative for an orchestra at Lyndale School started with students who were taking private string lessons in the community. There was a lot of interest on the part of parents and students in adding strings to the music program. 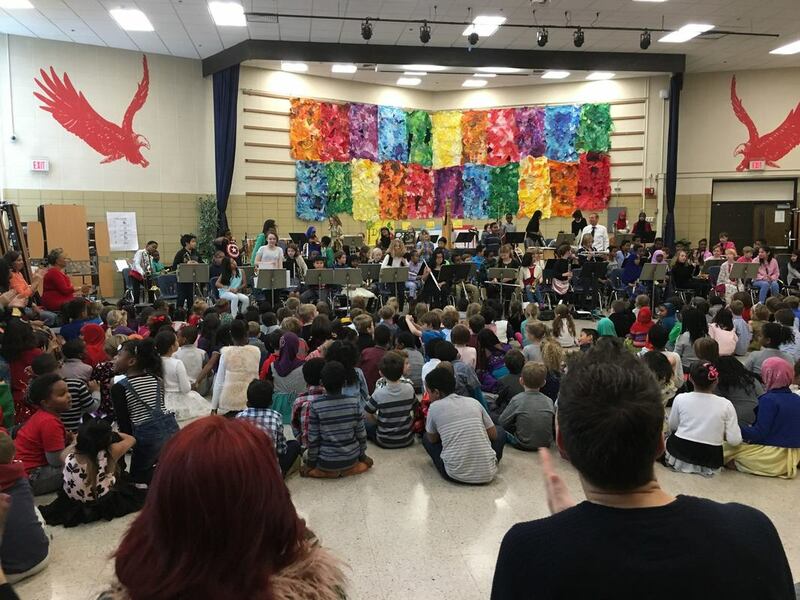 The school worked hard to find the money to fund the program and is proud to be the only elementary school in south Minneapolis that offers orchestra. The new orchestra includes violin, viola, cello and base. The band includes flute, percussion, trumpet, saxophone, clarinet and trombone. Orchestra and band leader Bill Scripps teaches all of these instruments. Students have small group instrument lessons once per week and full ensemble lessons once per week. The band and the orchestra perform for students and families at Lyndale School in December and in April or May. They also take a spring trip to perform at another school. Exciting! Bill Scripps has been teaching band and orchestra for over forty years! He first started when he was sixteen years old. Adults at his church knew he played the trumpet and asked if he would teach some of the children, forming a church band. Scripps loves his work and is openly delighted about having an orchestra AND a band at Lyndale School. He said he will be looking for a musical piece that can include both the orchestra and the band performing together. Normally they have to play separately because they play in different keys that don’t blend together. Lyndale School, located at 312 W. 34th St., is the community school for the East Harriet Neighborhood. For more information, visit the school's website Lyndale Community School or call 612.668.4000. Nancy Lee, director of arts programming at Washburn High School received an Honorable Mention as part of the Tony Awards 2016 Excellence in Theatre Education Awards. Lee was selected from 1,100 applicants from across the US for leadership in building a thriving performing and visual arts program at Washburn. The award honors dedicated professionals who discover talented students, nurture and inspire them, and help launch their lifelong journeys as theater supporters and professionals. The 2016 awards include one winner, two finalists and 20 honorable mentions. Mohamud Noor, newly elected school board member in November 2013, recently paid a visit to Lyndale Community School to tell his story of how he immigrated to the US in 1999 and became a leader in the Minneapolis Somali Community. Noor has a connection with Lyndale School since his wife, Farhija Del, worked here as a bilingual associate educator 7 years ago and now their two oldest children are now attending Lyndale Community School. Noor said Lyndale is a wonderful school and he is grateful for what the teachers and principal at Lyndale are doing. To read more about Noor's story click here. Bruce Wadman, EHFNA's Parks, Environment and School (PES) committee chair, worked with MPRB and the art teachers at Barton Open School and Lyndale Community School to transform the drab plywood panels that serve as winter protection for the fountain into colorful works of art. This wonderful example of collaboration between the parks, community and schools will provide winter enjoyment for local residents and park visitors for many winters to come. The project was funded by EHFNA and Guse Hardware.